Once again I'm hosting the What's in a Name Challenge. For the history of this challenge and to sign up for it, check out the brand new What's in a Name 4 blog. Because you might not be able to stand waiting to learn the new categories, I'll give you sneak peek here. 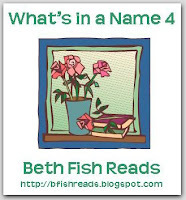 Be sure to click over to the What's in a Name 4 blog to see examples, sign up, and learn the rules. I hope you have room in your challenge schedule to join in the fun. This is one of my favorite challenges. This is one of my favorite challenges! I love the categories. Great categories! I'm excited to participate in this one! This challenge was one of my favorites this year, so you know I'll be signing up again. I'm already thinking of what titles can fit those categories. Hi Beth! I'll be joining again for 2011. I had so much fun with the Name challenge in 2010. Interesting new categories... I'm starting to plan already! I can't wait to sign up for this one again! The categories look hard too..it's going to be interesting to see what I can find. Looking forward to it! So looking forward to this challenge! Great categories! I am really excited about this challenge and haven't done it before! This was my first year to join this challenge and I enjoyed it. I'll definitely sign up again. Some of the new categories will be a challenge. Oh, why did I review "9 Dragons" today and not in January? Well, I am really happy you are hosting this wonderful challenge again, Beth, and no 5 should be very easy for me.